Those of you beyond the borders of the People's Republic of Massachusetts may not know that today is Patriots' Day — a state holiday — though you may know that it's Marathon Monday, the day of the annual running of the Boston Marathon. Some of us go to Lexington early in the morning and see the annual re-enactment of that April morning long ago; some stake out prime real estate along the marathon route; runners and others partake in the early-morning festival at the start line in Hopkinton. And then there are the bikers — cyclists, that is — including your humble HealthBlawger, who take the opportunity afforded by roads closed for the runners to zip out from the finish line to the start line and back again before the race begins. This year, since the organizers have moved the start time back a bit in recent years, I rode with a couple of buddies from the Johnny Kelly statue at Heartbreak Hill in Newton to the start and back — I mean, how crazy do you think I am? I'd have to wake up even earlier than I did to start and end in Boston before the race. Well, many of my riding buddies now think I'm really crazy, because after a few years of increasing pain in one side of my upper back, shoulder and arm while riding my road bike (more a symptom of aging than anything else, I suppose), "I got 'bent." In English, this means that I am now the proud owner of a recumbent bicycle, which I rode on the Marathon route this morning. Revolutionary, huh? The shoulder pain was replaced this morning by other aches and pains thanks to a minor spill … but I'm looking forward to many 'bent rides, now that I've gone over to the dark side. And now, time for the thank yous: I'd like to thank my friend Richard Dale, aka The Venture Cyclist — who is the only person I know who actually rides one of these things — for turning me on to the idea, and for lending me his 'bent for some riding on the open road (once I learned how to ride the darn thing). I'd also like to thank Scott Chamberlain at Wheelworks for teaching me how to ride this contraption. Finally, thanks in advance to all of you, who I invite to join me in supporting the Jimmy Fund and the work of the Dana Farber Cancer Institute. This August I will be riding in my seventh Pan Mass Challenge. 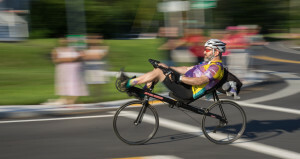 For those of you who are not familiar with this event, or have not yet supported my ride, the PMC is a two-day, 200-mile, 5000-rider bike ride benefiting the Dana Farber. It's the granddaddy of athletic fundraisers (this year's edition is the 31st), and thanks to its sponsors, 100% of supporter contributions go directly to the Dana Farber for cutting-edge research and patient care. This year's fundraising goal is $31 million. 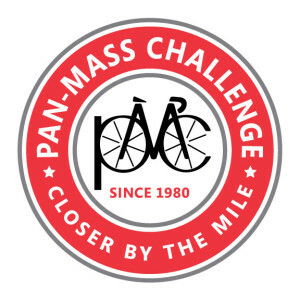 Please learn more about the event and the cause by checking out my Pan Mass Challenge rider profile, feel free to join my supporters' group on Facebook … and don't forget to donate to the cause via my PMC profile page. Thanks for letting me share the revolution — and the cause — with you. « Health Wonk Review: Block That Metaphor! As I have reached 50 and become less aerodynamic, I am steadily raising the stem on my road bikes to minimize the saddle to bars drop. I am surprised at the number of recumbents that I am seeing in the Seattle area. Yeah, raising the stem wasn’t enough for me … you should try it too.